Pio Pio has recently changed it's location to a more spacious locale across the street on Northern Boulevard. Through their enormous glass windows, you can certainly see that the move hasn't affect their business at all. The restaurant still attracts a large group of devoted patrons who are ready and eager to satisfy their fix on Pio Pio's famed rotisserie chicken. As soon as you walk through the door, the aroma of their roasted chicken immediately gets a hold of you and somehow you feel a lot hungrier than you did before. There is usually a long line of people waiting by the door, but it doesn't take that long for them to sit you down. You can always call ahead to make a reservation if you don't like to wait and it's usually recommended if you're going with a large group. For appetizer I like to start with their mixed seafood ceviche. They put together the right amount of lemon juice and seasonings that makes this dish quite palatable. However the size of their dish has gotten significantly smaller since the last time I ordered it. I wonder if they're cutting back due to renovation costs. The Matador Combo is great for a group of 4-5 people. The combo comes with fries and sausages (salchipapas), rice and beans, fried plantains (tostones), and avocado salad. I've never been a fan of their tostones because it always comes out dry and rather bland but their chicken never fails to deliver. 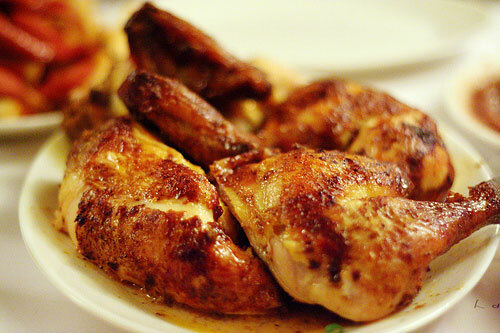 For the most part, the Pio chicken is tender and juicy and their blend of Peruvian seasonings and spices is what separates this place from all the other Peruvian restaurants around the neighborhood. And everyone can agree with me that it's the spicy green chili sauce that takes their chicken to a whole 'nother level. Their new location on Northern Boulevard has a nice and trendy feel to it. They have a large bar right by the entrance, trust me, you won't miss it. I wasn't even sure if they had a bar at their old place. The restaurant is still very loud and crowded and they still play the "Happy Birthday" song in Spanish every five minutes. They really need to start checking people's licenses, if you ask me. It's hard to have a regular conversation when you're there with company. You have to shout so the person sitting in front of you can hear you. So I really wouldn't recommend this place as a great "date" place. They have several locations in Manhattan, Queens and the Bronx but the one I go to is in Jackson Heights because it's ten minutes from where I live.